Our expert staff will prepare your planning application to maximize your chance of obtaining planning permission. We charge the same price if you live in a listed building or a conservation area. We submit planning applications to any local district council anywhere in England, Scotland or Wales. We prepare all of the necessary plans and drawings to the correct scale and we also complete all of the planning forms and declarations on your behalf. Our expert planning service is intended for the convenience of our customers only. We therefore charge a higher price initially but half of your payment is refunded when you order your building. The nett price payable by our customers is such good value that it is hardly worth making a planning application yourself. The pictures show some of the forms and plans we used in recent applications. Our planning service is available for any customer who wants to buy one of our buildings. Our prices for planning applications assume that the proposals are uncontroversial and unopposed. If you have any queries about how to ensure this please contact us. Preparing a planning application for submission to any local authority in England, Scotland or Wales. Preparing a planning application for a listed building or a property in a conservation area. An initial consultation with you to confirm the type and size of the proposed garden building plus other details of the design and the materials used together with the exact location of the building at your property. Completion of the relevant planning application forms. Completion of the ownership certificates and declarations. 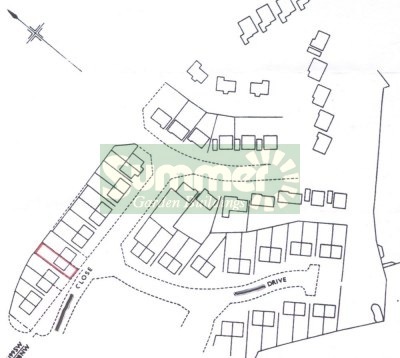 Preparation of a scale plan showing the location of your property in relation to other neighbouring properties. 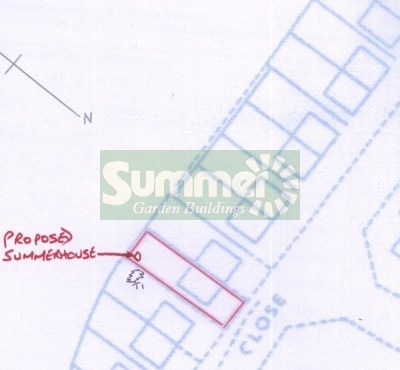 Preparation of a scale plan showing the location of the proposed new building in relation to other buildings and boundaries at your property. Preparation of an architectural scale plan and elevation drawings of the proposed building. All plans and elevation drawings are prepared to the correct scale as required for planning applications. Presentation of the completed planning application for your approval prior to submission. 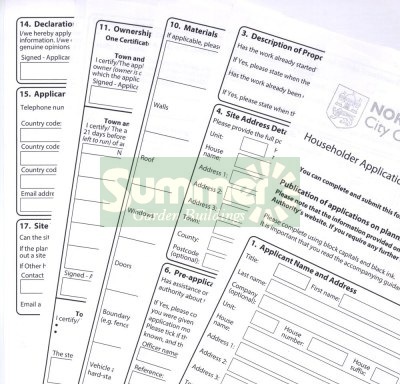 Non householder applications are more expensive because there are extra questions and additional information is required. The relevant category for our domestic planning applications is a "householder application" which includes "alterations or extensions to a single dwelling, including works within the boundary". This category applies to any "single dwellings including flats". In England the standard planning application fees for a householder application is £206. In Wales the standard planning application fees for a householder application is £190. In Scotland the standard planning application fees for a householder application is £202. Registered disabled persons are normally exempt from planning application fees. If you are unsure of the fee applicable please contact us or your local planning authority. Planning application fees are not subject to VAT, unless you are a VAT registered business. For this reason we do not include the planning fees within our charges. If the planning fee was included within our overall charge it would be subject to VAT and it would therefore be 20% more expensive. After your application has been approved 50% of our charges will be allowed as a credit against the overall cost of your building. For example, if you pay £180 for a standard planning application you will receive a credit of £90. When you order your building the overall price will be reduced by £90. The nett price payable to us for making the planning application is therefore only £90. If minor amendments to the original design or specifications are required by the planning authority one resubmission of a revised application is included within our standard price with no extra charge payable. If more substantial revisions are required including changes to one or more of the drawings a resubmission may be charged at 50% of the basic price i.e. £90 of which £45 is refundable when you order your building. There would be no charge for a resubmission in the unlikely event of an error attributable to us. When you order our planning service there is no way to specify which of our buildings you want or where it will be built. We will contact you within a day or two after you order with a list of questions. Please provide at least two daytime phone numbers if possible. 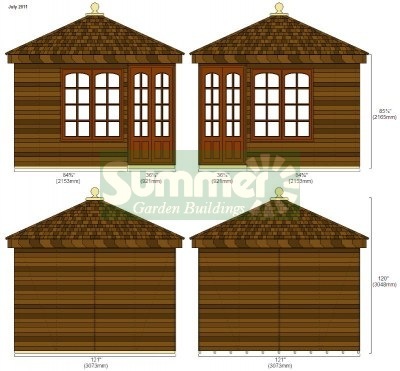 We need to know which building you want, such as "Summerhouse 10" or "Greenhouse 20" and which size. We also need to know any design details which affect the external appearance such as the colour, the roofing material if there is a choice and other features. We also require the distance of the proposed building from at least one of the site boundaries. For conservatories or lean to greenhouses we require a photograph of the adjoining wall. Non householder applicants include organizations such as schools and businesses. Non householder planning applications are more complicated than householder applications with many additional questions, hence the higher cost to prepare these applications. Extra topics include traffic movement, contamination risk, flood risk, environmental impact, noise, access for disabled people and refuse storage. In addition, we may need to know gross floor areas for some or all of the other buildings at the site. We may also need to know the existing planning uses which are permitted at the site, such as Retail (A1) or Offices (B1) or Warehousing (B8) or similar. We may need additional assistance from somebody within your organization to ensure that we have sufficient information to complete the application. If your planning application is unsuccessful you have a right of appeal. However, few planning appeals are successful and the appeals process is slow. It normally takes longer than a year to complete an appeal. If required we can submit an appeal on your behalf. Our price for submitting a planning appeal is £180 including VAT of which £90 is refundable when you order.